Although I don’t have an Apple Mac, I had a query if I knew of any Morse Programs that run on the Mac System. I found “Morse Mania” which looks good, using the Koch Method but I have no way of reviewing this software and I hope that someone sends me a review that I can post on the Morse Crusade website. I would like to give a warm welcome to Brian Hall GW0EDC who has volunteered to give up some of his busy time to help out with our Mentoring Scheme in North Wales & Cheshire. Brian is an Ex Royal Navy. man and boy and been a Morse lover for 53 years, former senior examiner for the RSGB. He has been successful in teaching Morse to both groups and individuals. The Morse Crusade is actively seeking new Mentors who are willing to give up a little of their time to help learners in their area, If you would like to add your name to the Morse Mentors Directory then please contact me. 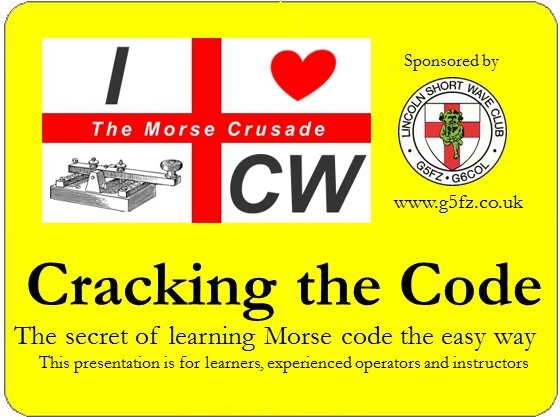 If we can help one learner become a good Morse Operator then we are happy because the Morse Crusade is achieving its aims. I would like to thank Graham G3ZOD for helping me publicise the Morse Crusade by publishing my article “Morse Mentoring by Email” on the FISTS quarterly magazine “Key Note”. 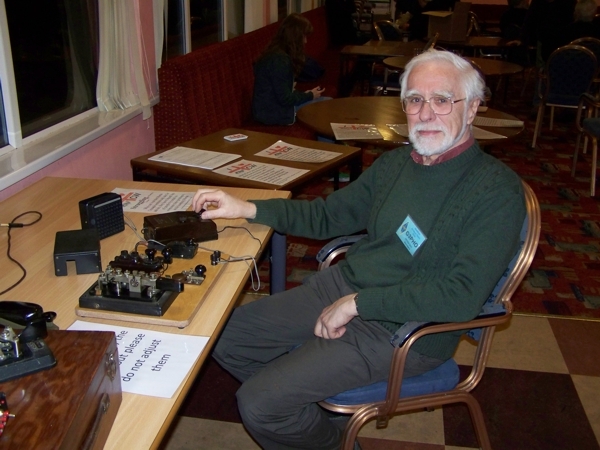 Graham is a very busy man being the FISTS Membership Secretary, Webmaster and Editor of Key Note and last year FISTS celebrated 25 years of promoting Morse Code. All my plans for the Morse Crusade being at the National Hamfest have had to be cancelled as my son has decided to get married in Gretna Green on the 28th of September and we have to travel up on the 27th. As part of the National Hamfest Management Team I am getting things organised for the Morse Tests and have enlisted the help of Martin Farmer G6BD from RAF Waddington ARC to stand in for me. Peter M0EJL and James G0EUN from Lincoln Short Wave Club will be there as usual. The Morse assessments are friendly and informal, on demand and best of all FREE! so why not have a go and get a nice certificate to hang up on your shack wall. Having just got rid of my Vodafone Brick and moved to the new technology of the Smartphone,(to me it is!) my first task was to find an android app that would be suitable for learning Morse and also be useful in Morse tests to save me lugging my laptop about at the National Hamfest. On my search for a decent app for my Smartphone similar to “Just Learn Morse Code” and Ray G4FON’s “Koch Trainer” I came across “Morse Trainer for Android” by Wolphi W8DA. I have to admit that I gave it the full thumbs up as it was exactly what I was looking for and now I can get rid of the laptop and just carry my key, oscillator and smartphone to tests. Learn or improve Morse code with Morse Trainer.If you are a ham radio (amateur radio) operator or just want to learn Morse code. With a lot of settings it is very comfortable to adjust Morse Trainer to your current level. – Random groups of five mode: Morse Trainer will play groups of five randomly selected letter, numbers or special characters. Those characters can be individually selected. If you want to learn just “s”,”i” and “e” just select the 3 letters and Morse Trainer will create groups of 5 with those 3 letters. – Real ham radio callsign mode: Morse Trainer will randomly play real amateur radio callsign from a database of 5000 callsigns which appeared in Contests over the last couple of years. – QSO text mode: Morse Trainer will play randomly play QSO text. The database consists of 300 different qso texts. – Most common English words mode: Morse Trainer will play randomly the 500 most used English words. – Own text mode: Enter your own text and Morse Trainer will play it over and over again. Morse Trainer is priced less than the cost of a fancy coffee and it is a great app to learn and improve you CW speed away from your amateur radio station or your PC. My New Years resolution was to be more proactive with the Morse Crusade and to try and revamp the website. I am keeping true to my resolution and have just published a new article “Putting Pen to Paper” which covers all the common faults that can happen when writing down Morse. Other articles are going to be revamped and new ones written so keep your eye on the blog to see what is happening. If anyone thinks about something they would like to see on the website then please contact me. The Morse Crusade seems to have become popular in France and after I received this email from Alain F5RUJ I decided to make the Morse Crusade also La Croisade Morse. After a recent contact from a Morse operator about his sending, it left me a bit confused. At first I though it could be he needed more practice in sending and sent him a few tips to improve his sending but their was still something playing on my mind about his stamina. as his sending was OK to start with but deteriorated after sending for a little bit. A couple of days later while playing with my RAF type F “bathtub” key that it suddenly sank in, as the bathtub is not an easy key to use for fast Morse as the spring fitted on them is very strong and can restrict your sending to about 12wpm, and it can tire you out after a period of time. I sent him an email about decreasing the tension on his spring and he said that after my first email he had started thinking about the tension and already decreased the tension on his keys and was quite happy at sending at 22wpm so problem solved. The Moral of this story is not to put too much tension on your key and make sure your gap is sufficient for your sending, the faster your Morse the less gap you need. Play about with the settings on your key so that it is comfortably set up for your sending. I am pleased to announce that the three candidates who booked tests for RSGB Morse Competency Certificate at the National Hamfest 2012 all successfully gained certificates, but I was disappointed that we did not have more people book tests this year. We had three times that number book tests last year, but I think it is mainly lack of self confidence and fear of the Morse test that puts potential candidates off. I used to be a Morse Examiner in the 1980’s when candidates needed to be sedated before taking the test as this was the most important test in their life, it would enable them to transmit on the HF bands and work stations all over the world.They were not allowed a second chance during the test and had to wait for over a week before getting the results of the test, pass or fail. Things have changed and you can now work on the HF bands without needing to know Morse and those that are interested in the Morse can now obtain a certificate from the RSGB to prove their Morse competency. Although to get a certificate you have to take a Morse test, I think it should be changed to having a Morse Assessment as I am now a registered RSGB Morse Assessor and I assess the competency of the candidates. I do not examine them as I am no longer a Morse Examiner, but now as a Morse Assessor I spend a long time with the candidates and assess their Morse proficiency. At the National Hamfest, my team is available from 10am to 4pm on both days to assess candidates, and my policy is that we properly assess the candidates and if they fail on the speed they requested, we spend time with them and they get a certificate for the speed that they are proficient at. On Friday I had a candidate who wanted a test for 20wpm which he failed, but he left with a certificate for 18wpm which he was proficient at. I will spend time with candidates to make sure that they do receive a certificate for the speed that I have successfully assessed them at. On very rare occasions a candidate will leave empty handed. This happened last year at the National Hamfest 2011 when a candidate requested to be tested at 25wpm and after I kept reducing the speed to find level where he was proficient and it got below 12wpm and he was still unsuccessful, I gave him some advice on how to improve his proficiency and told him to try again next year. I did not mind spending my time with him as I want to encourage and certainly not discourage Morse. My team at National Hamfest are very friendly and will genuinely bend over backwards to help you succeed in getting an RSGB Morse Competency Certificate and are willing to pass on hints and tips to help you increase your Morse proficiency. If you are attending the National Hamfest 2013 have a word with us as we are their to help you succeed on your Morse journey. The National Hamfest is upon us again and I am looking forward to seeing you there. I will be conducting the Morse Tests and although I haven’t got a stand for the Morse Crusade this year I will be available for a chat if anyone wants. I have other duties as Outside Trade Manager at the National Hamfest, but if anyone wants to find me, just go the the Hamfest Information Desk and they will contact me and I will come and find you or tell you where I am. I like to chat to other people about how they have learned Morse, or about any problems they are having as this always gives me more information how people rate different ways of learning so please share your Morse experience with me. While on this point of sharing experiences. I have a lot of visitors on this website who read the information they want without commenting on anything or sharing their experiences. Please share you experiences as it will help others on their journey through learning Morse properly. I would like to thank Robin G3TKF for informing me that trying to access the Morse Crusade using an I-Phone was impossible. Blah… Perfect showcase for an obsolete mode! Due to a bug in the system, for a while Comments were stopped or disabled, this has now been sorted and Comments are welcome on this site as it makes it more interactive so if you have something to say about a posting then please comment on it. How many times have you had a sinking feeling in the pit of your stomach after putting out a CQ and found a BAD BUG has landed on your frequency.